On my way to AXPONA’s Master Class Theater to catch Rob Robinson’s seminar on current-mode phono preamplifiers, I was buttonholed by David Janszen. 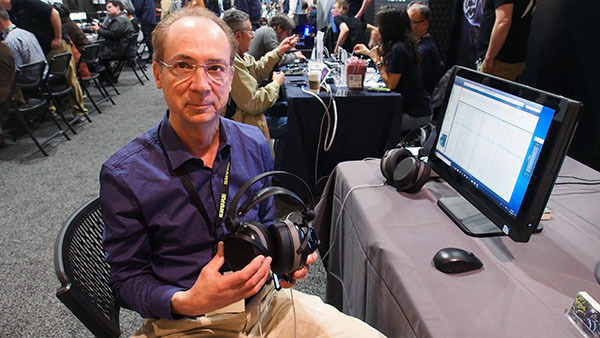 The Janszen name is synonymous with electrostatic drive-units—the midrange unit in the legendary Wilson WAMM was based on Janszen technology—and at AXPONA David was demonstrating prototype electrostatic headphones, the Lotus. The 1150V polarizing voltage for the electrostatic diaphragm is supplied by a battery and voltage multipliers—David says that the battery will last for a week and an half before needing to be recharged. To avoid having to use a large heavy transformer, the electrostatic panel is crossed over at 200Hz to a moving-coil woofer. Every component of the Lotus is 3D-printed and production will be financed by crowd-funding. The anticipated price will be $1495, with discounts for crowdfunders. The Lotus was being demonstrated with an exaSound D/A headphone amplifier but I also took a listen with the source an iPhone playing Maher’s Symphony 5. There was plenty enough volume.